Today you’ll learn how to add a link to the Events List page to your navigation for your website. This will allow your website visitors to quickly reach your events list page from any page or post on your site. Begin by logging into your WordPress admin. 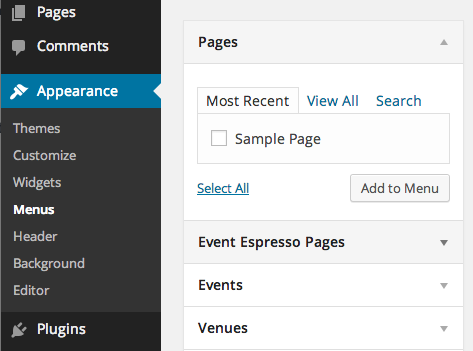 Then locate Appearance in the WordPress admin menus and click on Menus. This will take you to the Appearance Menus Screen. Now we are ready to add the Events List page to our site’s navigation. Click on the option for Event Espresso Pages. This will expand to show available options. Now place a checkmark next to Event List and click on the Add to Menu button. This will add a link to your Event List page to your current menu. 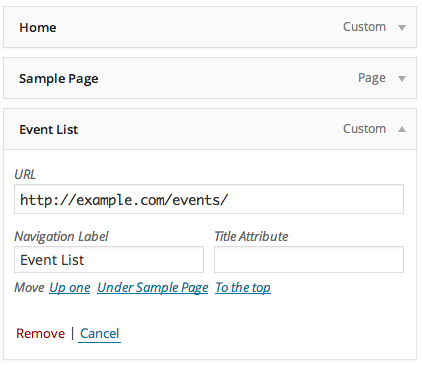 You can further customize the navigation label and setup a title for your event list page. Once you are done making changes, be sure to click on the Save Changes button. Then visit your website on the front end and you should see your event list page as part of your website navigation. Pro-tip: You can use the steps above to add a specific event to your website’s navigation. Instead of clicking on Event Espresso Pages, you’ll want to click on Events. Then place a checkmark next to your event and finish adding it to your current menu. Notes: in the video above we cover how to add a link for your events listing page to your website’s navigation menu.